I've always been able to see thing other can't . I just don't tell people so I'm kinda nervous saying this but I don't know what else to do. It all started about a year ago in winter this thing whatever it keep following me and popping up at random . I all ways know when it around because I get this bone chilling feeling of fear. Now my roommate know what I can do because she also been my friend for about 12 years. It has even woken her up one night when I was at work . She was so scared that she Co e to my job just because she didn't want to be alone . It has also attack me it left 3 deep slices down my back right through my shirt . I don't know what it is what it trying to do. I just want it to leave me alone . So if anyone know some one who knows a lot about the paranormal that can help let know I c an really use the help. I am sorry you and your roommate are experiencing something negative. You will want to use real resin, not incense because incense will not work the same as the smoke from these resins. The best way to heat the charcoal disc is with kitchen tongs over a candle until it is burning. 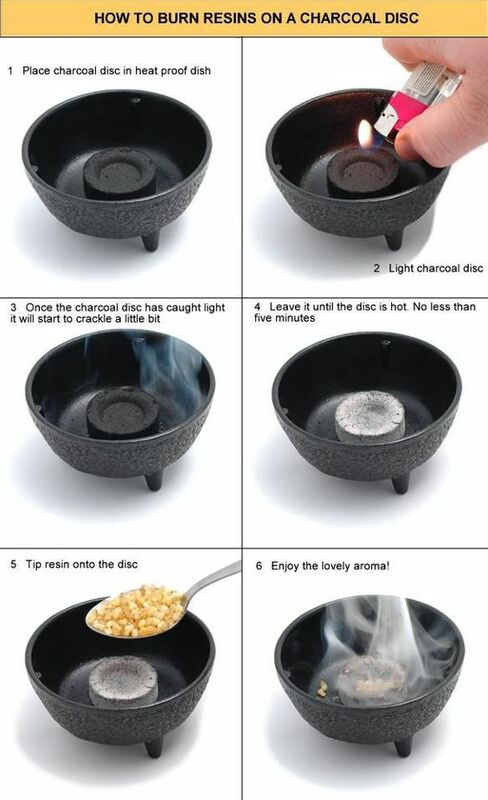 Place the charcoal disc inside a heat resistant bowl and then add the four resin pieces into the heated charcoal disc. You will notice a pleasant smelling white smoke coming up and it is this white smoke that actually cleanses the negativity from your home. These resins work equally well on cars, furniture, clothing, books, rugs, jewelry, or a person. Good house preparation is essential for a positive outcome. Make sure clutter is kept to a minimum and that the rooms, walls, windows, and floors are clean and orderly. Open everything inside which are closed like internal doors, wardrobes, cupboards, drawers etc so the smoke can enter the space. To begin the cleansing process, start at the open front door with the smoking resins. Ask (Whatever your faith is) to help you rid the house of all negative energies and to bless the cleansed environment. Proceed to the first room on your left moving in a straight line lifting and lowering the smoking resin from ceiling to floor, enter the first room and continue clockwise around the room. Again moving in a straight line to every corner in each room, lifting and lowering the smoking resins from ceiling to floor. Work the smoke into any wardrobes etc, taking your time and being thorough. Once at the rooms doorway continue in a clockwise motion to the next room and repeat until the house has been completed and you are once again at the front door. Once at the front door tell the negative energies to leave the house through the open door allow the resin smoke to cover the door frame then step out onto the doorstep and place the smoking resins on the door step. Allow the resins to smoke for several minutes. Thank (Whatever your faith is) for helping you rid the house of all negative energies and to bless the cleansed environment and the people who reside within the house. Rock salt can be used to cleanse the property outside. Scatter it on the ground around the house. Lastly, make sure you cleanse yourselves after cleansing the house. By showering and visualising any negativity being washed from your physical body and down the drain. Or if you prefer, take a bath with a couple of tablespoons of Epsom salts or rock salt dissolved in the bath water. What do you think attracted it to you a year ago? Ouija Board? Tarot Cards? Dark Arts? Haunted Items? Lewd behavior? Add-your-own? The "Bone chilling feeling of fear. "....and the 3 deep slices down your back and right through your shirt suggest something very much sinister and evil. Red flags for sure. If you are serious about what you are sharing here (not joking)... then please continue reading. 1. Leave a light on (small lamp) in your bedroom or wherever you sleep. And the same with your roommate. 2. Bring life into the rooms where it's most seen/felt. Do this by buying 2 medium sized plants per room. 3. Be sure to have fresh air running through the house. So open up all the windows everyday! 4. All curtains open in the daytime! Bring in the sunlight! 5. Make sure you both are out in direct sunlight a minimum of 15 minutes a day. 6. Fun joyful music playing throughout the house. Even Christmas music works well! 7. Don't talk to it... and don't talk about it while in the home. 8. Smudge the house with sage. If this continues to get worse... Pray every time you think about it for intervention, protection & relief! But only if you are religious. By the way... there's one thing you shared that might suggest you made this whole thing up... I hope that's not the case. But either way, I'm sure some will benefit from these things that Klainey and I have shared thus far. hello and welcome to the boards. The information that has been provided above is a really good starting point. did you want to try these techniques and let us know how you go ? Okay, I better take notes. This is good stuff. All I can add is white sage! Again and again!! Edited by daphnerose, 16 April 2018 - 08:26 PM. I have tried sages and I try to keep light but it take the light. This is not a joke. I try to see if I can find information on what it is but I have had no luck. Truthfully I have no I idea where left to look for information. No we do not play with ouija board or dark arts or anything like that. If I try to describe it may be some one on here no what it is.let see it tall at least 6 feet it skins is burnt it eyes and mouth is to big for it face. It dresses in a pantsuit the jacket has a tail and a top hat. It has a black cane with dark red jewels around the top but it move like all it joints have been dislocated. 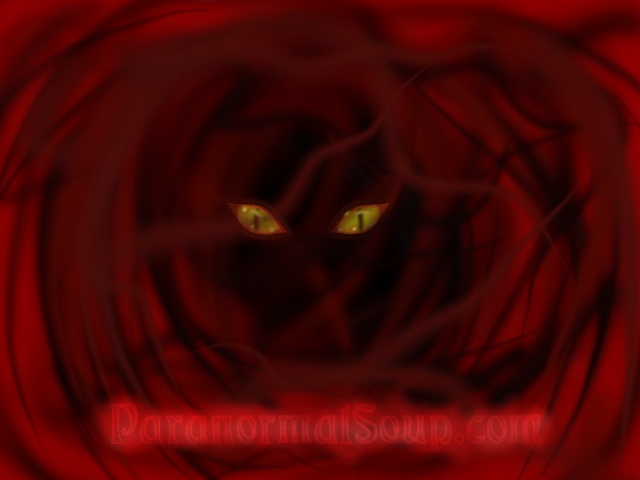 Entities can appear in a certain way to scare the one it's haunting. How often do you see it? And how long are you able to view it before it disappears? Do you take any medications? And if so, what are they? .. I just want it to leave me alone ... I can really use the help. If you really want some help, but don't know where to look, try contacting an experienced Holographic Kinetics teacher/practitoner. They'll be able to put you in touch with someone. The tail and top hat sounds similar to a lot of what people describe as shadow people.... what do others think? There are plenty of cases where shadow ghosts appear wearing black hats and even top hats, that's for sure. It's sad that shadow people dress nicer than I do. Lol. It seems like their MO doesn't it, to have this type of look. You can also use raw Black Tourmaline which is .925 (Sterling) silver wire-wrapped. Here are some places you can find them via Google. Good idea MacC, I hear this referred to quite often these days.